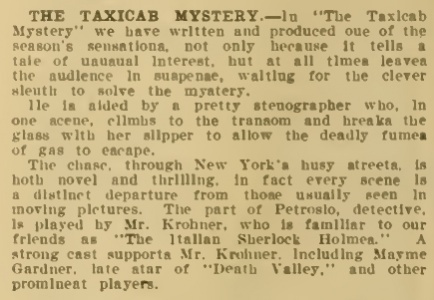 The Italian Sherlock Holmes is an American silent movie released on 31 october 1910, produced by Yankee Film Co. Black & White. ITALIAN SHERLOCK HOLMES. — An Italian adventurer, posing as a nobleman arrives in New York accompanied by a beautiful woman who is introduced to society as the Countess Zingara. They are received in the most exclusive society circles and arrange to secure invitations to a grand ball given by a wealthy Italian banker in honor of a visiting foreign ambassador. When festivities are at their height, the banker's wife discovers the less of a valuable necklace of pearls, valued at twenty-five thousand dollars. Her husband, desiring to avoid a scandal and not wishing to mar the pleasure of his guests, quietly telephones the Central Secret Service bureau for a trusted men. Petrosio, the famous Italian sleuth is assigned the case and he immediately calls at the banker's home where he is introduced as a foreign Count. Meanwhile, Murrile, the adventurer, drops the stolen necklace to confederates outside, and in doing so collects a quantity of dust on his coat sleeve leaving the imprint of his arm on the window sill. Petrosio is quick to notice the arm of Murrile and detects an expression of alarm on the face of his beautiful companion. Adopting various disguises, first as the cabby who drives the suspected pair from the ball, and later as an express man. Petrosio is successful in collecting a mass of damaging evidence against the suspects. 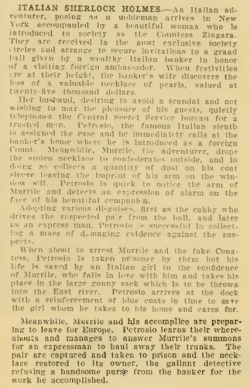 When about to arrest Murrile and the fake Countess, Petrosio is taken by them but his life is saved by an Italian girl in the confidence of Murrile, who falls in love with him and takes his place in the large gunny sack which is to be thrown into the East river. Petrosio arrives at the dock with a reinforcement of blue coats in time to save the girl whom he takes to his home and cares for. Meanwhile, Murrile and his accomplice are preparing to leave for Europe. Petrosio learns their whereabouts and manages to answer Murrile's summons for an expressman to haul away their trunks. The pair are captured and taken to prison and the necklace restored to its owner, the gallant detective refusing a handsome purse from the banker for the work he accomplished. 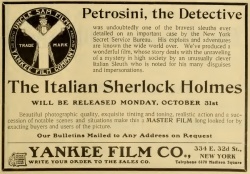 "The Italian Sherlock Holmes" (Yankee). - One of those melodramatic detective stories, full of the average impossibilities of all detective stories, yet processing a fascination from which it is impossible to escape. Here is a valuable necklace stolen and the detective really runs down the thief because he had a bit of dust on his arm. Of course many deductions are drawn from apparently insignificant sources, but the main proposition is that the detective brings the thieves to justice and recovers the stolen property. Then he walks away scorning the money offered him in payment for his services. It is all performed so well that one cannot help but follow it with growing interest until the end. Detective stories are quite as interesting on the films as they are in books. This page was last edited on 21 January 2016, at 14:32.